Eastbrook Homes is proud to announce the return of Taste and Tour from the 11th to the 14th of October 2018. Bringing together current Eastbrook homeowners and prospective homebuilders alike for fun, food, and refreshments, Taste and Tour furthers the cause of some great local non-profit organizations. The Eastbrook Homes Taste and Tour event raised more than $106,500 in 2017. This year, the company hopes to exceed that figure by matching up to $10,000 of participant donations for the non-profit partner at each location. Eastbrook Homes is proud to announce the return of Taste and Tour from the 11th to the 14th of October 2018. Originally intended as a one-time event to mark the company’s 50th anniversary in 2017, Taste and Tour has evolved into a community-centric event. Bringing together current Eastbrook homeowners and prospective homebuilders alike for fun, food, and refreshments, Taste and Tour furthers the cause of some great local non-profit organizations. The previous Taste and Tour event was so successful that Eastbrook Homes decided to make it an annual occurrence. Spread across fifteen locations, the event provides participants with the opportunity to preview new floor plans, see upcoming community phases, and learn about each featured non-profit organization and its impact. Taste and Tour participants will be given an event Passport and are invited to visit all fifteen of the listed locations throughout the week. At each location, visitors will be treated to food and drink samples from local area vendors and will have the opportunity to support that location’s featured non-profit partner. Participants will also receive a stamp on their Passport at each location. Guests who turn in their passports at the end of the event will be entered to win prizes, including a $500 Visa Gift card. Participants with more stamps on their Passport will be entered to win better prizes. Founded in 1967, Eastbrook Homes is West Michigan’s largest homebuilder with communities throughout Kent, Ottawa, Allegan and Muskegon counties as well as the Greater Lansing Area and Auburn, Alabama. 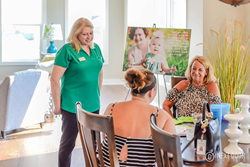 To learn more about Eastbrook Homes Taste and Tour 2018 or find out how to attend, please contact the Eastbrook Team at (616) 455-0200 or email us at concierge(at)eastbrookhomes(dot)com Hope to see you there!